Kino Lorber's DePatie-Freleng Collection continues with one of the last series of theatrical cartoons, Sheriff Hoot Kloot produced between 1972 and 1974. By this time pre-movie cartoons in theaters had largely fallen by the wayside, but it's been said these were mostly shown at drive-ins which usually had multi-feature programs and had a number of trailers and shorts between films in order to keep something always on the screen while giving people time to visit the snack bar before the next movie. 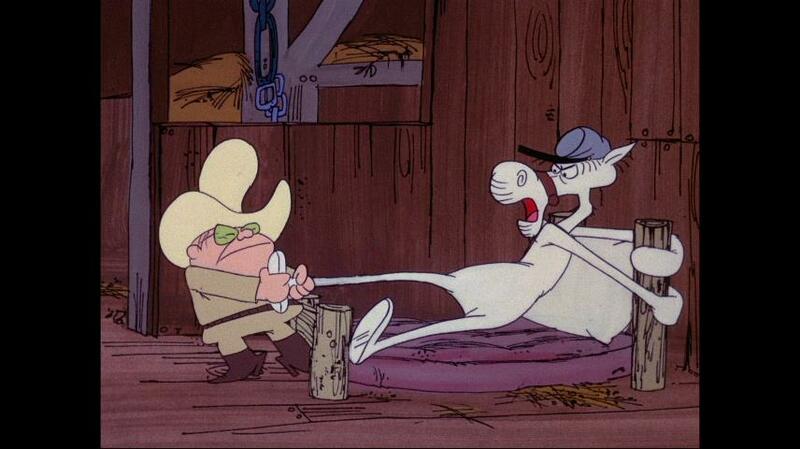 The hero of these shorts, voiced by DePatie-Freleng regular Bob Holt, is a diminutive loud-mouthed sheriff in the stereotypical Western town of Cactus Gulch who rides on an aging, tired horse who often complains about those conditions (also voiced by Holt in a style similar to Walter Brennan)- in the earlier shorts he's called "Hoss" but we later find that his real name is Fester. Hoot Kloot is said to have been inspired by a sheriff character who appeared in TV commercials for a Dodge dealership in Southern California around that time, who also inspired Jackie Gleason's Buford T. Justice in Smokey and the Bandit. Like the other cartoon series in this collection, the focus here is more on gags than storylines and the shorts still adhere to a 6 1/2 minute average running time, but there is a bit more variety here than the one-note formulas of the previous series. 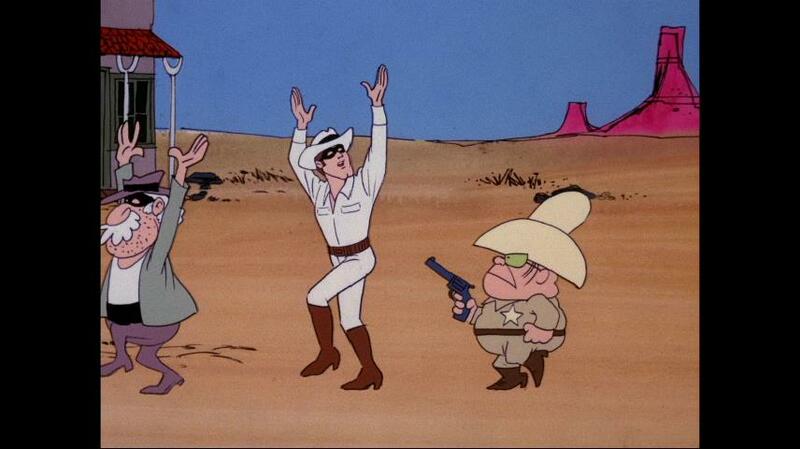 The first villain that the sheriff has to deal with is Crazy Wolf, who rustles a herd of sheep in the first short and pops up a few times later causing other types of mayhem- he's a rather annoying character speaking manically with a high voice (from Larry D. Mann in some shorts and Bob Holt in others) and an obnoxious laugh, but thankfully he doesn't appear in every short. 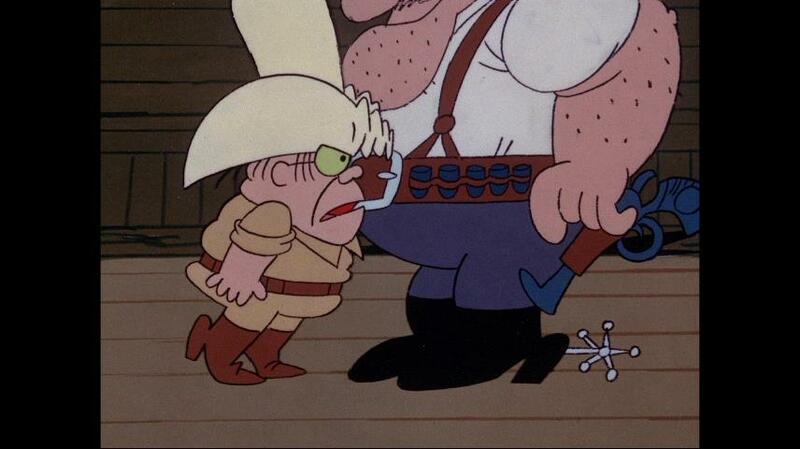 Unlike other series like "Ant and the Aardvark" which mostly had the same two characters facing off, there's a variety of adversaries here, most of them take-offs on traditional Western characters including the oafish Wild Bill Hiccup (who's normally a smaller wimpier guy until he transforms through hiccupping) and Billy the Kidder. Crazy Wolf does provide one of the more interesting plots in "Pay Your Buffalo Bill" where he sets up a traveling medicine show selling a potion that enables a very tiny man to become a big menace- until the effect wears off at the worst possible time. 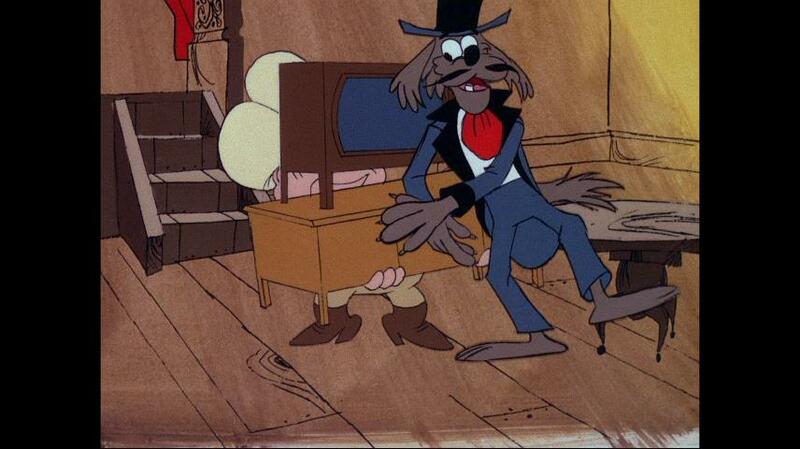 There are a lot of gags that harken back to Warner's Looney Tunes which many of the same animators also worked on, such as a bad guy painting an elevator door into a mountain to escape, and there's even a dead-ringer for "Granny" in the short "As the Tumbleweed Turns" in the form of a rich spinster who refuses to move out of her mansion to make way for a railroad. The overall visual style here is consistent with the studio's other cartoons, with abstract and often psychedelic background patterns in some but not all of the shorts. As with the other volumes, the presentations here are very clean in sharp focus with colors that are bright but don't overwhelm. Brush strokes are clearly visible most of the time, which had me marveling at how good the picture looked in the otherwise weaker efforts. The one exception is the short "A Self-Winding Sidewinder" which has colors that look almost faded and the entire short appears a bit out of focus. All shorts are in a 4x3 ratio, which wasn't commonly used in theaters when they were made having me wonder how they were framed there- they appear to have been drawn for the ratio shown here. Audio quality of the mono audio tracks is also consistent with the previous volumes, nothing special but reasonably clean, encoded in 2-channel DTS Master Audio that stays properly centered. All of the tracks here seem to be in good shape, unlike the previous volumes which usually had one or two outliers that sounded worse than normal. Two featurettes that also appear on the "Blue Racer" disc are repeated here: "DePatie-Freleng's Range Rovers" focuses first on the former series, with discussion of "Hoot Kloot" afterwards including a print ad from the Dodge dealership that inspired the character. "Art for Art's Sake" focuses on animator and director Art Leonardi, with appearances from other DePatie-Freleng staff as well. Seven cartoons include audio commentaries, and as on the previous discs they're authored separately so you can't switch between them and the main audio. Participants here are the same as on the Blue Racer disc: Mark Arnold, Jerry Beck, Greg Ford (who expresses his dislike of Crazy Wolf in the first short) and William Hohauser, with a bit of archival audio from director Bob Balser on "The Badge and the Beautiful" which like his appearance on the previous disc sounds to have been recorded from a phone conversation and overall difficult to hear. If you've enjoyed the previous volumes in the DePatie-Freleng Collection then you can't go wrong with this one. While they might not be well-known enough to be considered classics, they're still great examples of animation from the early 1970s that is far higher quality than that of most animation done for TV at that time. I still found these shorts a bit monotonous to watch all in one sitting, but they're certainly good for laughs in smaller doses.